PLEASE ALLOW AT LEAST 3-4 WEEKS FOR DELIVERY AS THIS ITEM IS NOW MADE TO ORDER. DELIVERY FREE TO UK MAINLAND ONLY. 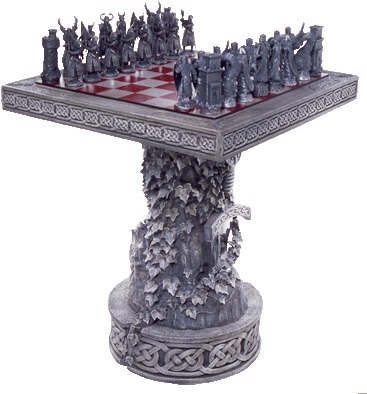 This truly magnificent Arthurian Chess Table, Stand and Board comes complete with the full set of Chess Pieces ("White" metal>), all of which is manufactured to the most amazing standards by Les Etains du Graal of Paris. The stand features the Sword in the Stone on one side and Camelot Castle on the other. The table top is decorated with Celtic Knotwork around the sides and the Chess Board slots neatly into it. Standing approx 800mm high x 640 x 640mm this most wonderful item will be the talking point and centrepiece of your home.